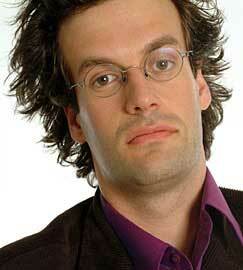 Marcus Brigstocke is an English comedian and satirist who has worked extensively in stand-up comedy. He started his comedy career while he was at Bristol University studying drama. He won the BBC New Comedian of the year in 1996 and is now associated with comedy, writing and acting regularly on television, film and radio. In 2005 he appeared in BBC4's The Late Edition which was his own topical show recording over 50 live programmes over several years. This show now tours as the Early Edition and is an Edinburgh Festival favourite. It was at the Edinburgh Festival In 2006 that he previewed his sell out national tour, which went on to become the top selling DVD Planet Corduroy. TV appearances include Live from the Apollo, Have I Got News For You (host and panellist), The A-Z of Music, News-Knight with Sir Trevor McDonald, Stephen Fry’s QI, Would I Lie to You?, Question Time, Marcus Brigstocke's Trophy People, Saturday Night Live ...Again, and Argumental. In 2006 Marcus spent time in France recording Excuse My French when he had 4 weeks to learn the language and then perform stand up in French to audiences in Marseille and Paris. More recently he has successfully transferred I've Never Seen Star Wars from Radio 4 to television. His acting work includes Simon Nye's BBC 1 sitcom The Savages, BBC3's Vacant Possession, (Twisted Tales) and We Are History. Film credits include: Love Actually, Beyond The Sea - the life story of Bobby Darin, In Piccadilly, Telstar and Short Film About John Bolton. He features a lot on Radio 4 being a regular as the angry young man on The Now Show with Punt and Dennis, Giles Wemmbley-Hogg Goes Off , Museum Of Everything and The Unthinkable. Other recordings include Just a Minute, Newsquiz, The Today Program, The Unbelievable Truth, 2000 years of Radio, A funny thing happened on the way to the dispatch box and 99p Challenge.